The White House announced that President Trump has asked the U.S. Trade Representative to consider an additional $100 billion in tariffs on Chinese imports. In response, China’s commerce ministry said that the country would implement countermeasures if the U.S. goes through with the proposal. While the President has not shied away from tariff threats, National Economic Council Director Larry Kudlow and Treasury Secretary Steve Mnuchin have tried to tamp down talk of a trade war. Kudlow told the press that that the threats were only a way of bringing China to the negotiating table, and Mnuchin said he was “cautiously optimistic” of a resolution. While markets shrugged off trade war fears early in the week, the announcement sent the Dow tumbling almost 600 points on Friday. The U.S. economy added 103,000 new job in March, short of the projected 170,000. March job growth marked the slowest month of job growth since last fall. However, although job gains missed the mark, unemployment remained at historic lows. The tight labor market has been reflected in wage growth, with year-over-year hourly wage growth accelerating to 2.7%. The Labor Department also revised January and February’s job growth numbers downward, indicating 50,000 fewer jobs were created in January and February combined than previously estimated. Fed Chair Jerome Powell made his first public speech since assuming chairmanship of the Fed in February. Powell told the Economic Club in Chicago that the labor market appears to be close to full employment, and that inflation would likely tick up noticeably this spring. To counter rising inflation, he said that the Fed would need to continue to gradually increase the federal funds rate. Most conspicuously missing from his remarks were any in-depth discussion of trade conflicts; Powell only told reporters it was too soon to tell if trade issues would affect U.S. economic growth. JPMorgan Chase CEO Jamie Dimon said in his annual letter to shareholders that investors are underestimating the risks of inflation. Dimon warned that the economy is at risk of overheating, and that the Fed may end up raising rates significantly to combat inflation. While the Fed currently has two more rates hikes penciled in for this year, he noted that low expectations for inflation mean investors are underestimating the possibility of faster rate hikes. Dimon also elaborated on a number of issues in the 46-page letter, praising last year’s tax reforms while urging the Trump administration to reconsider joining the Trans-Pacific Partnership. Former Treasury Secretary Larry Summers assailed President Trump’s attacks on Amazon, calling them “Mussolini tactic[s].” Summers described Trump’s tirades as “jihads with the power of the federal government against companies whose CEOs’ private activity [Trump] doesn’t find congenial.” Trump has repeatedly berated Amazon and its CEO Jeff Bezos on Twitter, claiming the company is bankrupting the U.S. Post Office. Many of these claims have been debunked, and Summers said that the tweets are “potentially quite dangerous for our business confidence.” Amazon’s stock (AMZN) has fallen 10% over the past month. US benchmarks swung from negative territory to positive and then back. 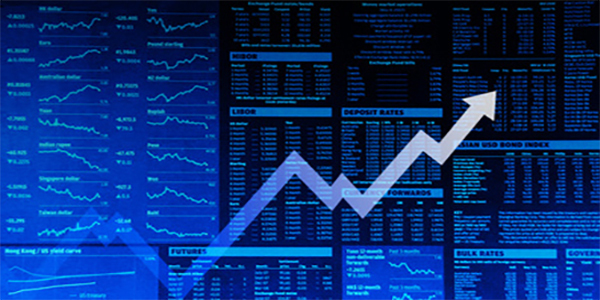 The Dow Jones Industrial Average (DJIA) finished down 0.7% for the week, the Nasdaq Composite (COMP) closed down 2.1%, and the S&P 500 (SPX) finished down 1.4%. European benchmarks fared better than their U.S. counterparts. The UK’s FTSE 100 Index (FTSE) finished up 1.8%, and the German DAX Index (DAX) closed up 2.4%. Some Asian markets were up, while others were down. Japan’s Nikkei 225 finished up 0.5%. India’s BSE Sensex finished up 1.7% and Hong Kong’s Hang Seng closed down 1.2%. Investors seem to be in a “wait and see” phase with equities markets. For the past three months, even on strong weeks, money hasn’t been flowing into the market. The week after the February market plunge, investors pulled almost $24 billion out of the market, and the money hasn’t come back in. The Money Flow Index (MFI), a 0-100 measure of the outflow/inflow of money into a particular security based on price and volume, hit 85.18 when the Dow hit its all-time record high on January 26th. Since then, the MFI has trended downward and has fluctuated around 50, and has not climbed back above 65, even on good weeks for the market. The Wall Street Journal’s measure of money flows paints a similar picture; over the past month, money flow for companies on the Dow declined 3.5%. The good news is that over the same time period, the up/down ratio, a ratio of volume on good days for stocks to volume on bad days, remained just above 1 for most sectors, meaning institutional investors aren’t panic selling. However, the money flow numbers indicate that there is a lot of cash that has been rotated out of equities into hard cash or into other markets like fixed income. It seems that investors are really waiting to for volatility to calm down before buying into stocks. The CBOE Volatility Index (VIX) swung wildly over the course of the week, and until the VIX settles back down, investors may just keep their money out of equities. With the bears out in full force, it may be some time before the Dow sets another all-time high record. Markets should heed Jamie Dimon’s warning. Dimon’s apprehension is justified, as noted in previous editions of Last Week in Markets. Job growth is starting to slow, as evidenced by March’s jobs data, and wages and inflation are starting to pick back up. However, the federal government has opted to largely ignore this, and the economy is set to receive large amounts of stimulus in the form of lower taxes and higher spending late in the business cycle. As many market observers have pointed out, this is a recipe for stagflation – shrinking GDP combined with higher inflation – barring significant action from the Fed. Even if the Fed moves to stem this inflation by rapidly raising interest rates – the way it did in the early 1980’s – it could send the economy into a recession – as it did in the early 1980’s. However, investors appear to be far more concerned with the prospects of a trade war. A Bank of America Merrill Lynch survey found that a trade war is the #1 concern among fund managers. However, as noted last week, a full-blown trade war would lead to a 1-3% decrease in world GDP over the next couple years, by no means a small number, but not nearly as devastating as stagflation or a recession caused by rapid interest rate hikes could be. Saber-rattling over a trade war may make for better headlines that get more clicks, but the real threats to the economy over the next few years are higher inflation and higher interest rates. Investors would be wise to follow inflation and the Fed very closely in the coming months and years. Trump has the potential to hurt Amazon more than you might think. While some have dismissed Trump’s attacks on Amazon as “foolhardy,” others have realized that Amazon doesn’t hold all the cards. One option Trump has is to raise parcel rates, forcing Amazon to pay more for delivery through USPS. While many have noted that Amazon’s deal with the Post Office is actually profitable for the Post Office, Trump has insisted that the USPS is losing billions because of the deal. Considering that 64% of U.S. households have Amazon Prime, if the President directed the Post Office to raise its parcel rates, Amazon may either pass on costs to its customers, or switch delivery providers, neither of which would play out well for Trump. Trump could also just wait for the contract to expire, since the deal expires in October. A better option from the President’s point of view might be to stymie a multi-year, multi-billion dollar deal the Department of Defense is working out with Amazon to move its data to the cloud. As of now, the DOD hasn’t yet awarded the deal to Amazon, but many see Amazon as the frontrunner due to its dominance in the cloud computing market. If Trump convinced the DOD to award the contract to another company, it would strike a major blow to Amazon’s cloud computing business. However, the most significant way the President could go after Amazon would be to pursue antitrust litigation against the company. Trump has a number of avenues through which he could attack Amazon in this way. If regulators reinterpreted antitrust law, the FTC and/or the DOJ could punish Amazon for unfair competition. The administration could also go after Amazon the way the EU went after Google, by charging Amazon with prioritizing its own products over the products of other merchants who are dependent on Amazon’s platform. The easiest route to go down may be cracking down on Amazon’s acquisition spree. Amazon acquired Whole Foods last year, along with Ring, a company that makes electronic doorbells, and it is also planning on getting into the healthcare sector. The White House has already shown a penchant for blocking M&A. However, any antitrust litigation brought by the federal government would require a lot of evidence, and Trump’s tweets aren’t going to pass for evidence in an antitrust case. In short, the President has a lot of options for going after Amazon, some better than others, some easier than others. With Chief of Staff John Kelly’s moderating influence fading, it’s possible that the President attempts to punish Jeff Bezos for owning the Washington Post through one of these methods.